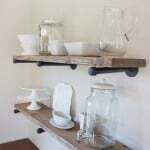 I have been dreaming of shelves above my buffet for awhile now. 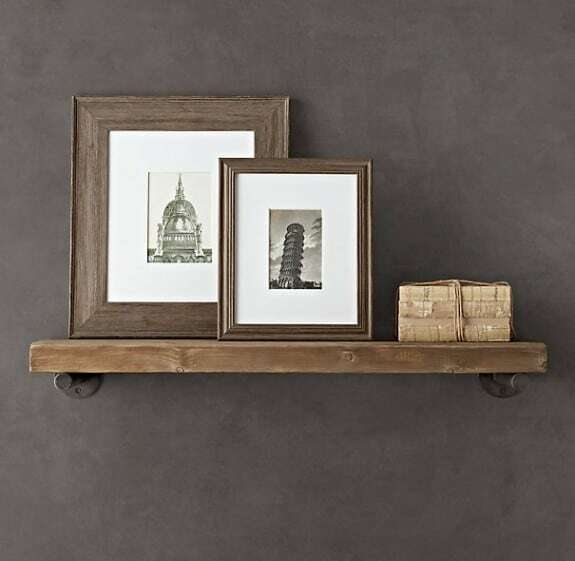 When I saw this image from Restoration Hardware, I knew they were perfect! I just needed to make a larger version. I am in love with how they turned out. 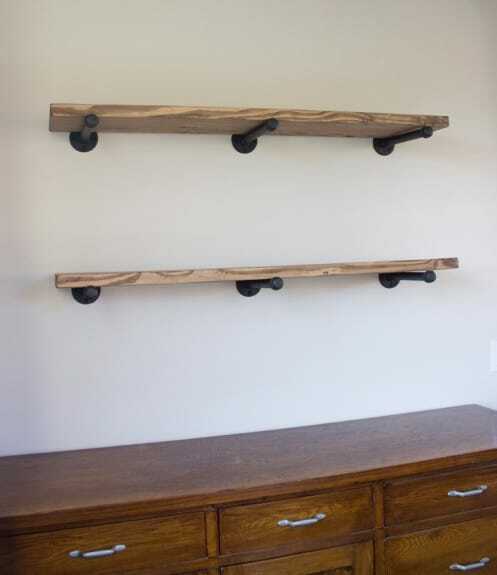 Each shelf is 4 feet long. The handy guys at Home Depot cut the wood in half for me so I had two perfect 4 foot shelves. Then comes the labor intensive part. 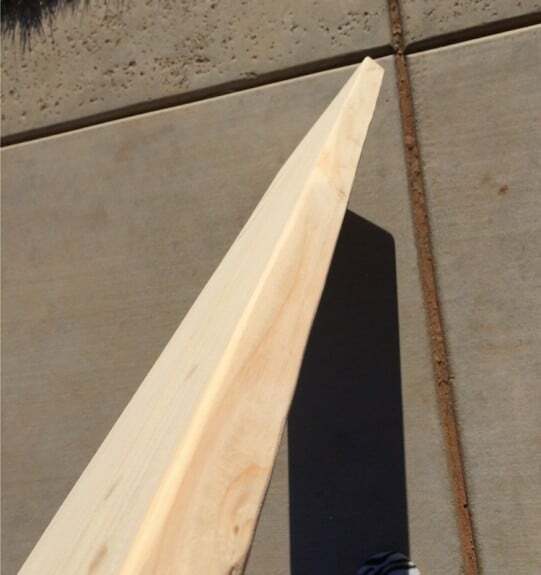 Get ready for some sanding. I wanted the wood to look older so I had to sand the edges down- a lot! I tried to do it a little uneven too so it looked naturally worn. 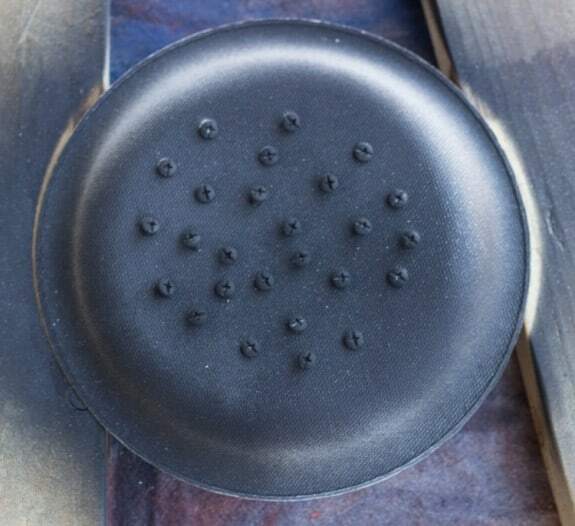 I also smoothed the top and bottom down so they were smooth to the touch. 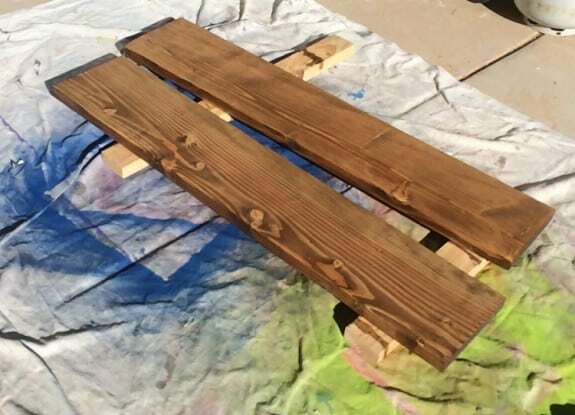 Next came the staining. I used the special walnut because its a very neutral wood color, not too red or too yellow. 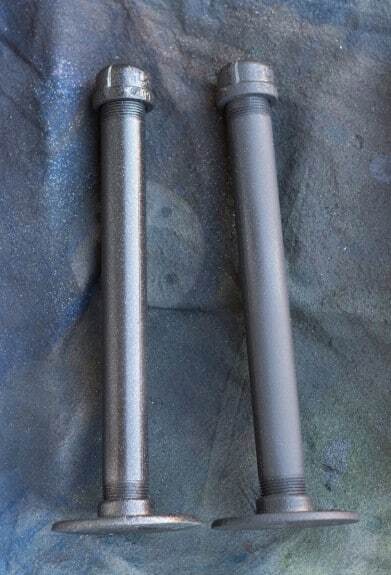 For the pipes, I first sprayed them with the textured spray paint. It doesn’t matter what color you use because you are just going to spray over them with the flat black. I also sprayed them fully assembled so I could get them on tight and not have the textured spray paint interfere with the pipe threads. I used a paper plate so that I could spray the screws too. Then it was time to install. We used a huge level and made sure we got them very straight and perfectly spaced. 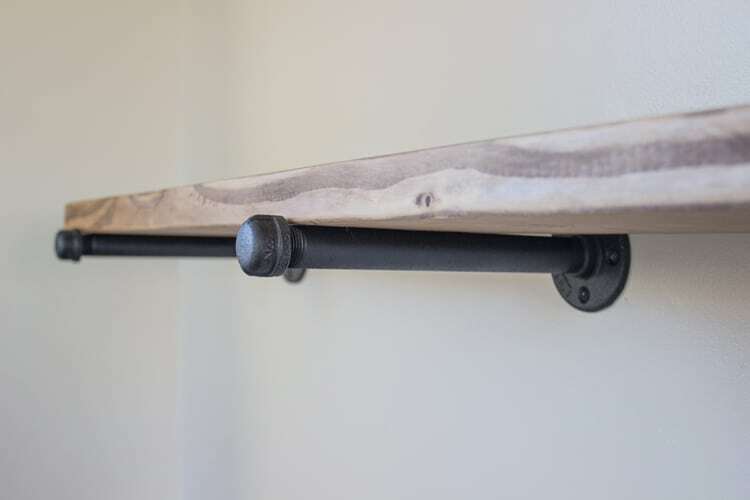 We installed them into the wall with toggle bolts since the shelves would be holding a lot of weight. 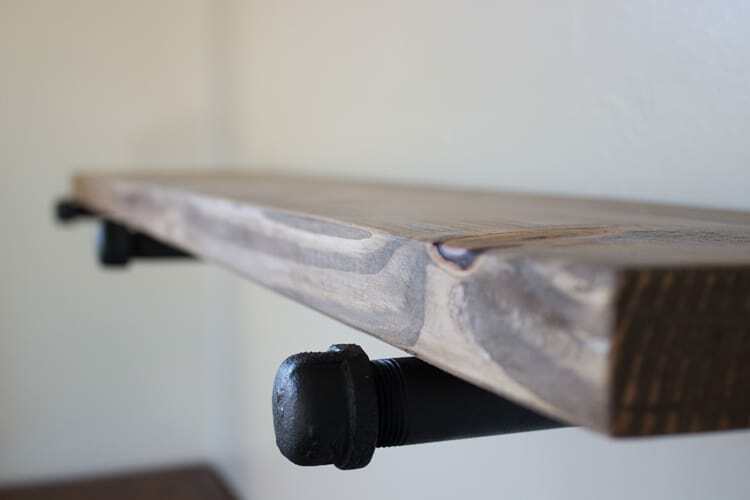 I didn’t use any polyurethane on the shelves to keep them as natural looking as possible. 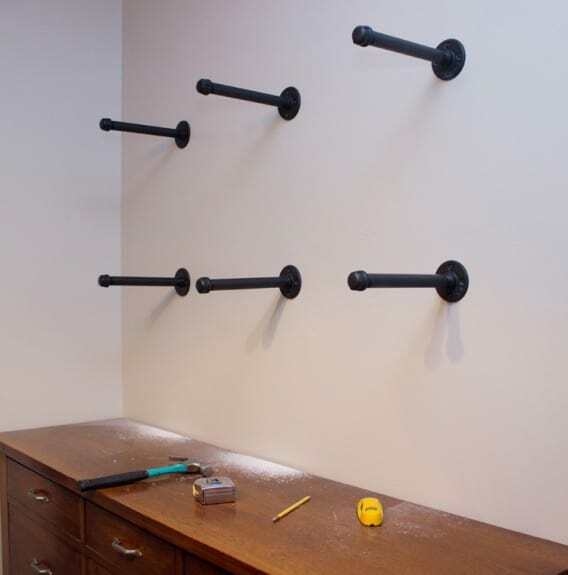 Once you have your pipes up you simply lay the wood over the pipes and they stay in place and are remarkably sturdy. The pipes have a great iron look to them. You can see the wood has imperfections and I love them! The overall look is great. Now I just have to decide what color to paint my buffet! Are the shelves attached to the brackets? 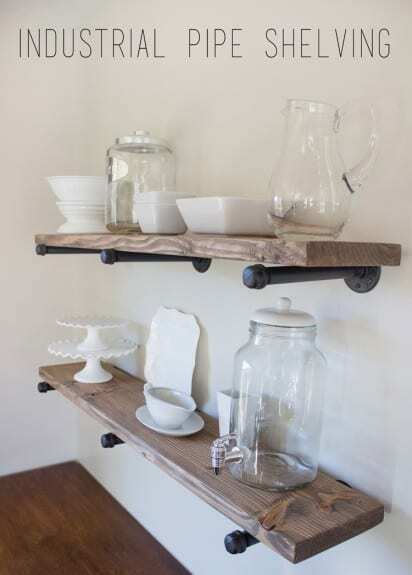 I doesn’t look like like she attached them but you could use a U-bracket underneath the shelf to attach it to the pipe. 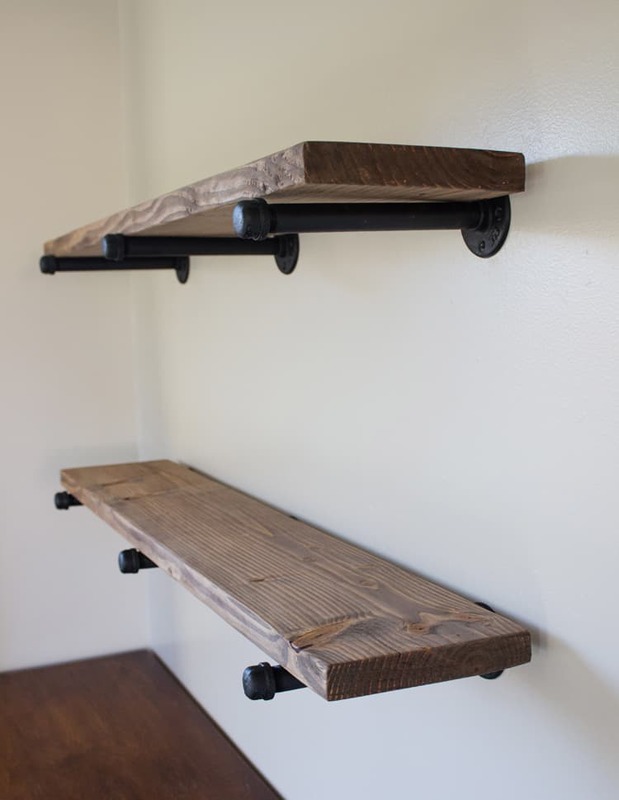 I am curious about the weight of the 4 inch shelves. I bought 1x pine boards which are very light weight, but the look isn’t right, but the 2x is very heavy. Any input is appreciated. Thank you! Hi, can I ask where you bought the metal parts from? What are they used for normally? I have been searching the Internet and can’t find anything like it, I am based in the UK any suggestions? I have my reclaimed wood ready to go! Any help would be greatly apprecIated! 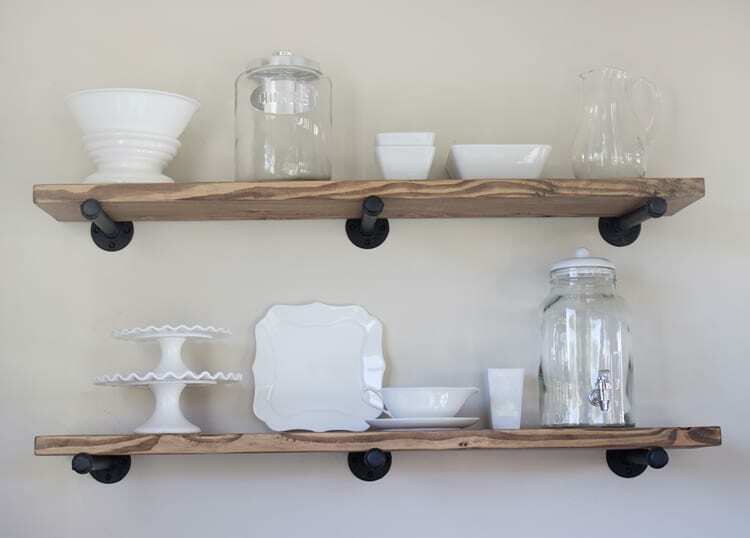 I love these shelves sooooo much! The metal pipe is used for plumbing. 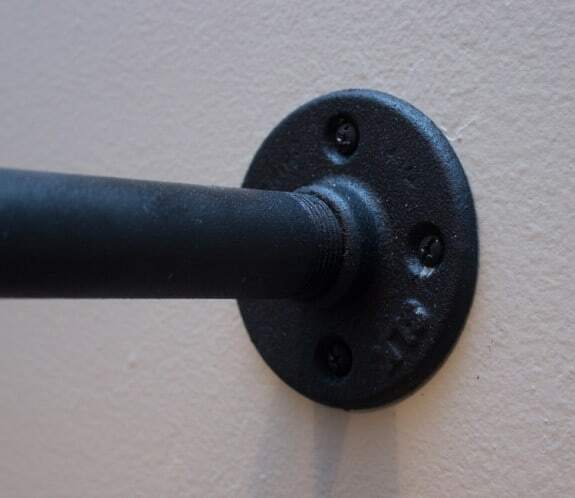 The wall brackets are commonly called floor flanges. They are a galvanized pipe. These are galvanized pipes used for plumbing. Not sure if they are used in the UK but you can check with the plumbing department of a hardware store. Good Luck, i am going to put them up this weekend. My husband found black ones at Lowes. Ohmygosh, are you serious?! I am in LOVE with this!!! Love, love, LOVE it! Pinning! 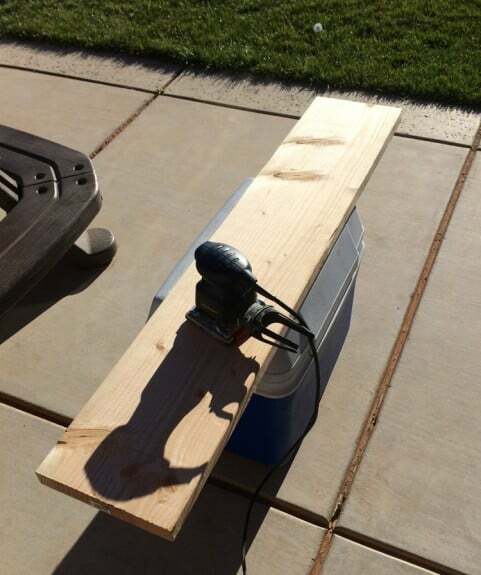 can’t wait to build an industrial table. I loove the look! Love it!! I really love that industrial look too but hate how much it costs! Definitely going to be trying this.